How cool are these? Go Nora! Neopolitan. Update: These are by Nibbles by Nora, see her photo here. 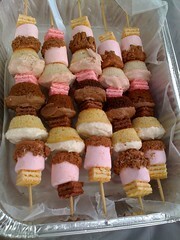 To see more photos and an interview with Nora about how she made these cupcake kebabs, click here. oooh! Delicious looking! Would be perfect for a party!! oh cool!!! these look great!!! perfect for a campfire! Yummy, these look so delectable! Now there is a kebab i would actually eat! I love them, such a great idea for summertime picnics!